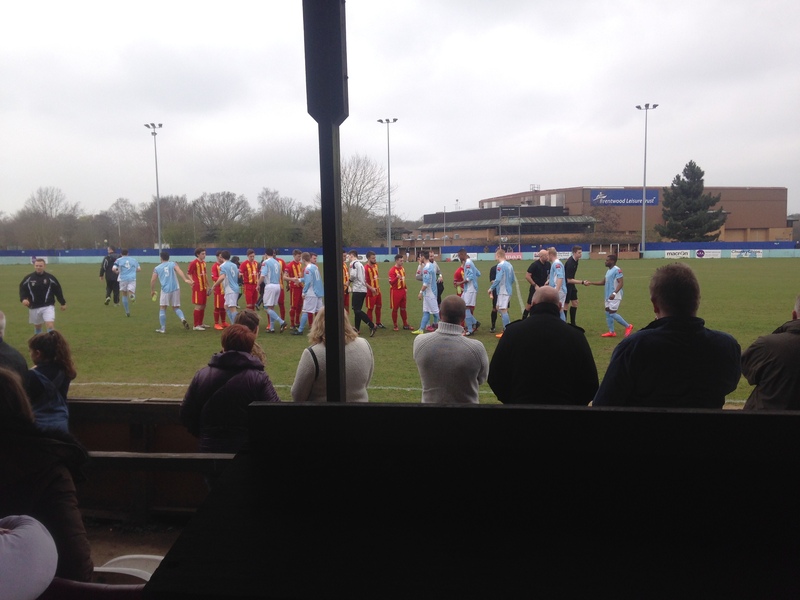 Brentwood Town are through to the Ryman League North playoff final after a dramatic 4-1 penalty shootout victory away to AFC Sudbury at Wardale Williams Stadium. Neither side could be separated within 120 minutes despite Brentwood being down to 10-men, which was decided by captain Martyn Stokes penultimate penalty. Ollie Bowles was the standout player for Brentwood keeping them in the contest throughout the match and in the shootout saved two vital penalties to put Brentwood through. Brentwood will now face local side Thurrock at The Brentwood Arena, in the playoff final on Sunday. AFC Sudbury almost scored within 23 seconds as Luke Callander pounced on Brentwood’s defensive lapse and his shot on the edge of the box was well held by Ollie Bowles. Kris Newby had a free-kick for the home side 25 yards out, which deflected off the wall and had to be parried by Bowles away down at his bottom left post. From the resulting corner a goal mouth scramble was created as the ball was knocked to the far post and the ball fell to Craig Parker on the half volley but came back off the crossbar. A short corner taken by Sudbury, fell to Parker to shoot which was deflected- in the box off James Love and Bowles had to re-adjust and claw out a superb save to palm it away for a corner. Just five minutes into the second half, Sherwin Stanley clipped a ball across field for Sam Bantick who cut inside to shoot but was saved down low at the near post by Marcus Garnham. Callander made it past Stokes to break the Brentwood defence but Bowles was quick off his line and blocked the shot with his leg. 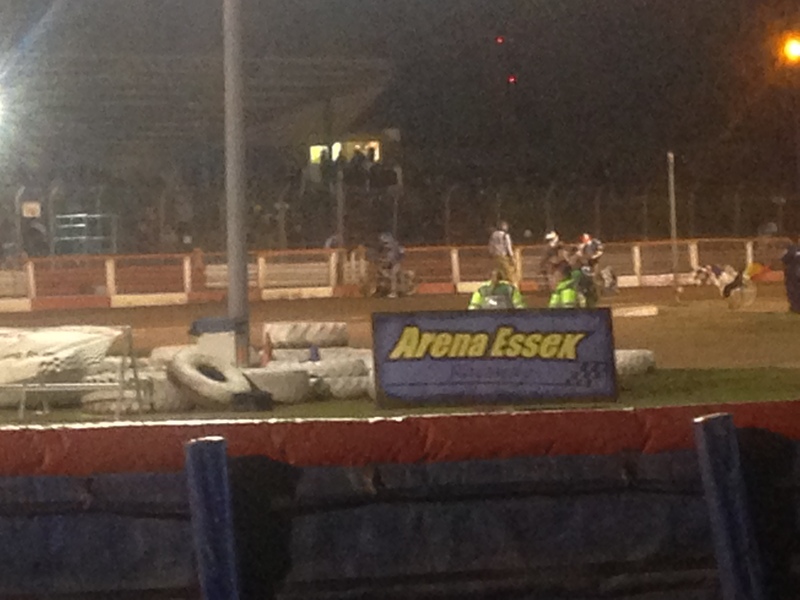 The home side had another chance as Newby ran at Gardner, cut inside and his shot was held by Bowles. Stanley battled in the middle of the park and burst forward, to slot in Love who turned the last defender but his shot was scuffed into the hands of Garnham. Callander again dangerous and gained a yard on Stokes to shoot but was saved again by Bowles with his outstretched leg. In injury time, Bantick whipped in a cross for substitute Tom Richardson to head goalwards which went just wide. Early in extra-time Stokes headed the ball off the line for Brentwood as the Sudbury striker beat Bowles to the ball in the air, but was cleared away by the captain. In the second half of extra time, Shad Ngandu was given a second yellow for a late tackle on Clarke and was sent to the stands. Brentwood had a great opportunity with nine minutes to play, as a long ball by Love put Richardson in one on one but his shot was saved away for a corner by Garnham. With moments remaining Clarke was in on goal after Sudbury won the knockdown but his shot on the edge of the box went over. Into penalties and Richardson stepped up first for Brentwood which he sent the keeper the wrong way to gain an early lead. James Baker made the long walk to the spot and Bowles again excelled himself with a great save down to his right, to give Brentwood the upper hand. Substitute Jason Dobbs was next to take a spot kick and his shot was just powerful enough, despite a strong glove from Garnham – to squeeze in the top corner, to give Brentwood a two goal lead. Parker put Sudbury on the board as he slotted in. Love kept Brentwood’s two goal advantage as he tucked it passed Garnham. Newby was up next for Sudbury and his shot at Bowles was saved by his leg as he dived left. Captain Stokes stepped up with the crucial penalty which he coolly slotted into the bottom right corner as Garnham went the wrong way, to book their place in the playoff final. This entry was posted in Football, Sport and tagged AFC Sudbury, Brentwood, Brentwood Town, Ryman League, Ryman League North. 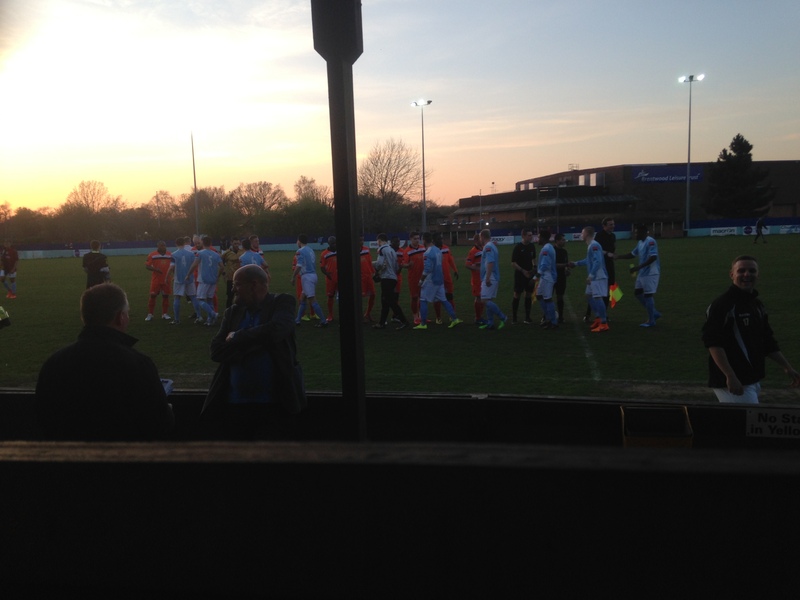 Brentwood Town finish their final Ryman League North match with a 2-0 away loss to Heybridge Swifts at Scraley Road. Despite Heybridge ruing an early second half chance from the spot as Sam West’s penalty was saved. 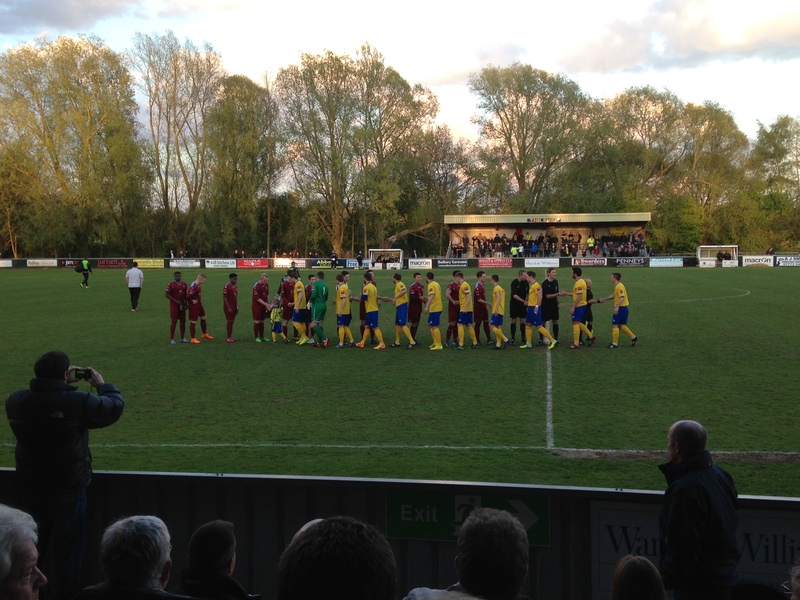 A three minute Billy Hunt brace separated the sides, as Brentwood made five changes ahead of their now confirmed away play-off semi-final against AFC Sudbury on Wednesday evening. Heybridge had the first chance 12 minutes in as a corner was headed out to the edge of the box, as Shamido Pedulu lashed a shot which rocketed off the crossbar. Brentwood had their first opportunity, from a long throw which came off a Heybridge player to put Conor Hogan in down the left- he cut inside and his shot at the near post was saved by Danny Sambridge. Heybridge almost scored from a free-kick as it was whipped in to Sam West whose unmarked header was straight at Sam Cole. With a goal mouth scramble in the Heybridge box, Brentwood nearly scored as Tom Richardson rose and beat the keeper in the air, but was cleared off the line by the defender and away from danger. Heybridge were in on goal six minutes before the break as Pedulu lobbed Sam Cole and as he went to tuck the ball in Louis Baucutt was back to head it away for a corner. The home side got a penalty seven minutes into the second half as Christian Mbulu pulled Billy Hunt’s judged by the referee. West stepped up and Brentwood keeper Cole guessed the right way to save low down to his left. From the resulting corner Cole went to punch the ball clear but went down injured, play continued and the Heybridge player’s shot hit Cole on the floor and was eventually cleared so Cole could receive treatment. Brentwood won a free-kick out wide on the edge of the box, Louis Baucutt stepped up and whipped it in near post which had to be parried by Sambridge. Heybridge took the lead 72 minutes as Tyler Hayes slotted in Hunt down the left, running away from goal- on the turn rifled a left foot shot into the top corner at the near post. The host doubled their lead three minutes later, after a long ball up to Jack West to hold the ball up and laid it off for Hunt to strike just outside the box and caught Cole off guard. Heybridge held off any Brentwood pressure to claim three points and finish off the last league game of the season, with a respectable 12th league finish. This entry was posted in Football, Sport and tagged Brentwood, Brentwood Town, Heybridge, Heybridge Swifts, Heybridge Swifts vs Brentwood Town, Ryman League, Ryman League North. 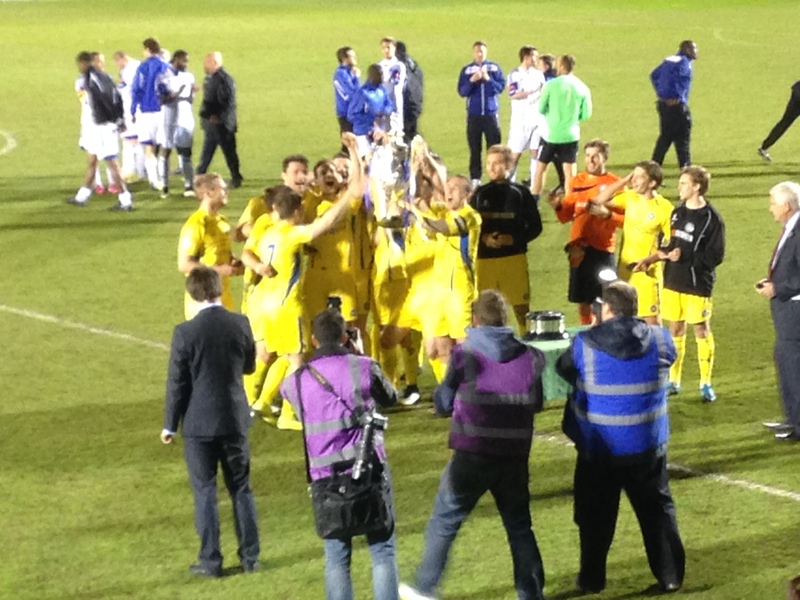 Conference South club Concord Rangers retained the Essex Senior Cup with a convincing 5-0 victory over nine-man Billericay Town at Victoria Road. Joe Gardner gave Concord an early lead before Billericay were reduced to 10 men after captain Richard Halle was given a straight red for tripping Tony Stokes as the last man. The Beachboys grabbed a second shortly after the sending off as Stokes slotted in from close range and Gardner rounded off some great team play to put Concord 3-0 up at half-time. Danny Glozier scored Rangers’ fourth from the spot before Billericay went down to nine after Ricky Sappleton was sent off for violent conduct. Substitute Lewis Taaffe completed the scoring as Concord became the first team to retain the cup in 10 years. Both teams narrowly missed out on the play-offs in their respective league campaigns, so they were keen to end the season with cup success. 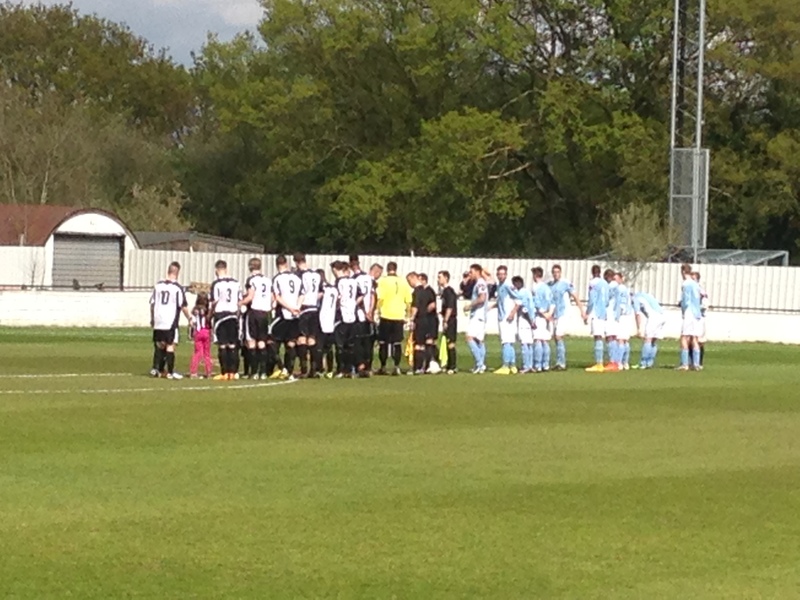 Both teams started well but Concord were first to score just four minutes in. Taylor Miles’ through ball cut the Town defence in half and Gardner tucked it coolly past Kitteridge. Billericay were reduced to 10 men with just 11 minutes on the clock as a long ball was lifted over the defence for Stokes who was in on goal but he was hauled down by skipper Halle and the referee had no choice but to send him off as the last man. Concord extended their lead three minutes later as Miles – again the supplier – knocked the ball over the top for Stokes in the box and his shot slotted underneath the keeper. Danny Cowley’s side grabbed a third just after the half hour mark as Stokes flicked the ball into the box for Gardner to stab it past Kitteridge. Gardner almost grabbed his hat-trick three minutes before half-time following a Concord break, but his shot was palmed away around the post. Billericay made a lively start to the second half with Afolabi Obafemi rifling a shot off the crossbar, however any hopes of a comeback were put to bed when Concord were awarded a penalty just before the hour mark after Ryan Melaugh brought down Gardner just inside the box. Glozier stepped up and sent the keeper the wrong way to slot home Concord’s fourth. Billericay went down to nine men 14 minutes from time as Sappleton was given a straight red after some deliberation for leading with his arm into a challenge with Gary Ogilvie. Concord rounded off a professional performance with a fifth as Steve King knocked the ball down for substitute Taaffe to bundle the ball in from a yard out. 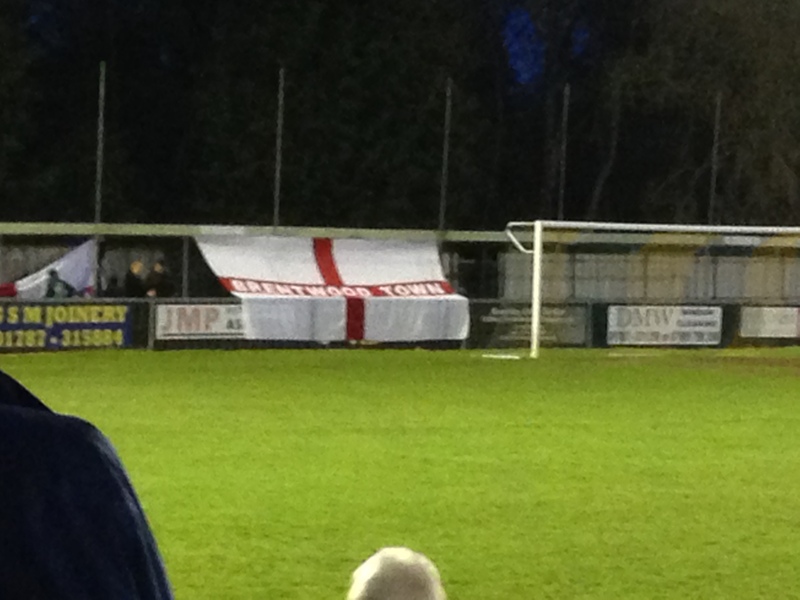 This entry was posted in Football, Sport and tagged Billericay, Billericay Town, Billericay Town vs Concord Rangers, Concord, Concord Rangers, Essex FA, Essex Senior Cup, Tony Stokes. Brentwood Town secured a playoff place with a game to play, after a tense 2-2 draw against Chatham Town at the Brentwood Arena. Sherwin Stanley took the lead for ‘The Blues’ in the first half, but Chatham equalised from kick off in the second half through George Humber. The away side went infront midway through the second half with a free-kick from Joe Bingham. Substitute Sam Bantick was brought down with 9 minutes to go and Stanley stepped up to claim his brace as he converted from the spot, to secure a playoff spot after other results. Brentwood Town got off to an immediate start 36 seconds in as Andrew Freeman’s cross was helped on by Robbie Rees but came back off the crossbar and away from danger. ‘The Blues’ had another opportunity as Rees’ cross was deflected to the far post for captain Martyn Stokes but his shot went over the bar. The home side gained the lead 21 minutes in as a high clearance by James Love was chased down by Stanley to beat the last defender, nick the ball off the keeper and score into an empty net. Chatham Town had a great chance to equalise, after a poor clearance by Ollie Bowles the Chatham striker attempted the shot which was deflected by Stokes but bounced just over the bar. The visitors equalised 37 seconds into the second half as Connor French turned Stokes and slotted in Humber to tuck past Bowles. Brentwood almost restored the lead after great play by Brentwood, Daryl Robson laid the ball off to Love whose long range shot had to be tipped over by Ryan Nicholls. Chatham took the lead 66 minutes in as Joe Bingham’s free-kick was whipped across goal, Humber ran across Bowles which distracted him as the ball went straight in. Brentwood were awarded a penalty with 9 minutes to go after a flick on from substitute Tom Richardson for substitute Sam Bantick, to beat the keeper to the ball but was brought down in the box by Nicholls and the referee pointed to the spot. Stanley stepped up and tucked it into the bottom right corner to equalise. In injury-time Brentwood nearly nicked it as Bantick’s corner was helped on by substitute Christian Mbulu and Stokes on the turn shot just over the bar, to settle for a point. This entry was posted in Football, Sport and tagged Brentwood, Brentwood Town, Brentwood Town vs Chatham Town, Chatham, Chatham Town, Ryman League, Ryman League North. Brentwood Town fell to their second straight defeat as they remain fourth after they lost 3-1 at home to Barkingside at the Brentwood Arena. Calvin Poku’s brace has kept Barkingside’s survival hopes alive, as they now close the gap to one point off safety with two games remaining. Sherwin Stanley took the lead with a first half header, Barkingside equalised in the second half from a Lee Weemes close range shot. 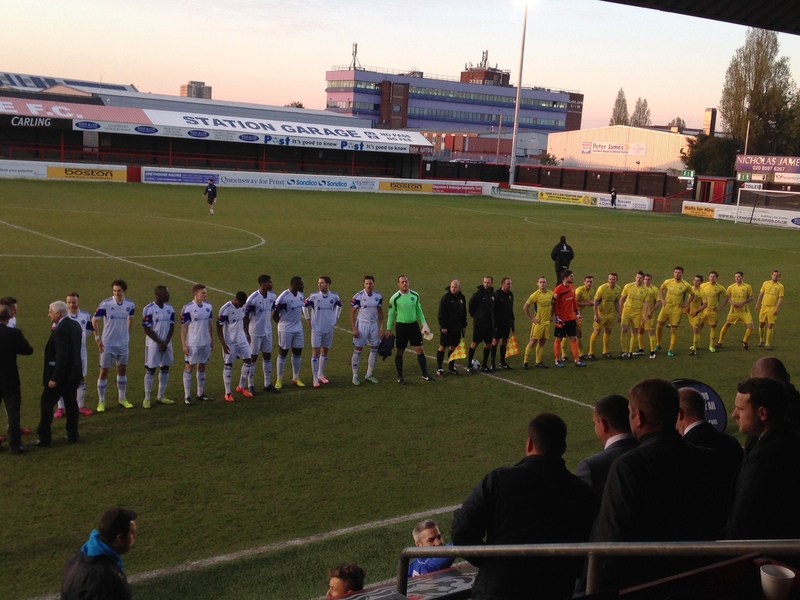 The away side took the lead shortly after through Poku and claimed the three points in injury time with his second. Brentwood had the first real chance 16 minutes in, as a loose ball was flicked back into the box and defender Ryan O’Rawe kept onside, took it round the keeper but just over ran the ball as he missed an empty net. Barkingside showed their attacking intent from a set piece as Reece Trantor lashed the flick on across goal but was hooked away by captain Martyn Stokes. ‘The Blues’ had a glorious chance just after the half hour mark as Sam Bantick played in Tom Richardson down the right for a foot race between him and Chris Clark, which he won and was taken out by Clark on the edge of the box. The referee decided he was not the last man with Richardson running wide and avoided the sending off with just a yellow. Brentwood broke the stalemate eight minutes before the break as Jack Gardner’s free-kick came back to him, he clipped the ball back into the box for the unmarked Stanley to guide passed Clark, to lead. Barkingside had a great opportunity to level on the stroke of half-time as Lee Weemes broke through on goal from a poor headed clearance but his hesitancy cost him, as Bowles smothered it. The home side with a great chance to double their lead as Shad Ngandu helped on the ball over the defence for Bantick through on goal but his volley went wide. Brentwood missed opportunity to extend their lead, as Stokes attempted dink of the keeper was saved by Clark, cost Brentwood. As Barkingside went straight down the other end and capitalised on the counter as Poku on the edge of the box squared it to Weemes to tuck home. Barkingside took advantage of the open game and converted their opportunities, as Poku was alert to a defence lapse in concentration to tuck it passed Bowles into the bottom corner. The away side grabbed a third in injury time as substitute Jason Fontaine burst on goal from a defensive error, to fire the ball across goal to be tucked in by Poku for his brace and will keep the visitors survival hopes alive. 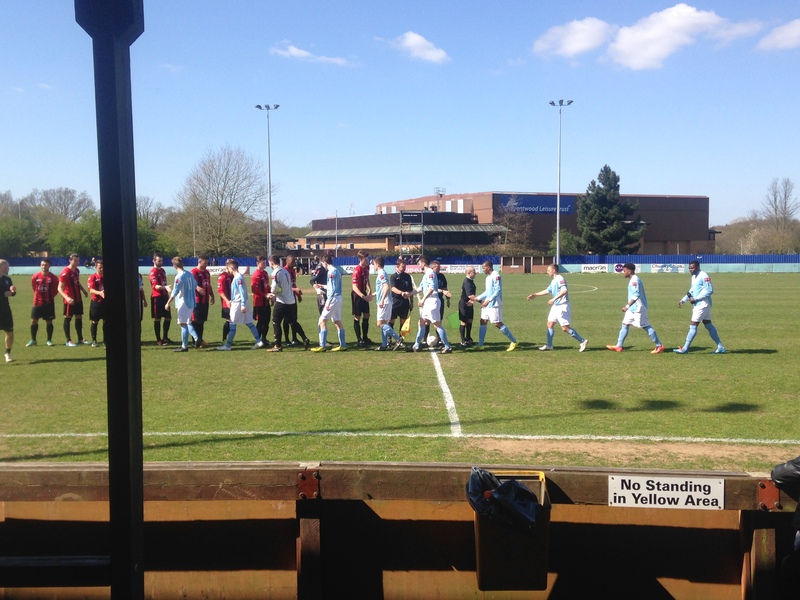 This entry was posted in Football, Sport and tagged Barkingside, Brentwood, Brentwood Town, Brentwood Town vs Barkingside, Ryman League, Ryman League North. Brentwood Town move up to third as they remain unbeaten in six, with a narrow 1-0 home victory over local side Tilbury at The Brentwood Arena. Sherwin Stanley’s 72 minute goal was the difference as he notched up his 19th league goal of the season, for Brentwood’s fourth straight win. Brentwood’s first chance was through Tom Richardson with a back heeled for Robbie Rees to run on to but his strike went just wide inside the box. ‘The Blues’ almost scored 24 minutes in as a free-kick by Sam Bantick was flicked on by Martyn Stokes but was hooked off the line and over the bar by Jack Pooley. A corner by Brentwood, was headed off the crossbar shortly after as Bantick’s whipped in corner was met by the unmarked Alex Akrofi, Rees’ follow-up shot whistled just wide. Brentwood were denied again by the Tilbury defence, Rees with the free-kick towards the far post for Danny Dafter to head across goal but hacked off the line by the Tilbury defender. The home side were denied by another goal line clearance as Bantick’s cross was deflected into the penalty area for Akrofi to rise and looped his header over the keeper but not the last defender. Tilbury missed a great chance just before the break as Ryan O’Rawe’s header was loose and into the path of Neil Richmond but was fired over from close range. The visitors had the first clear cut shot on goal in the second half as the right back Bradley Webb was aloud time and space and his shot outside the box went just over the bar. Substitute Sherwin Stanley created a great chance for Akrofi as his half volley hit the outside of the post just inside the 18 yard box. Brentwood broke the deadlock 72 minutes in as Akrofi lifted the ball over the defence for Bantick to burst goalwards and squared the ball across goal for Stanley to tuck home. Tilbury piled forward in search of an equaliser, Rees hooved the ball forward and turned defence into attack as Akrofi beat the last defender but clipped his shot just over the bar. Brentwood held on in the final minutes to keep a second consecutive clean sheet to leave Tilbury frustrated and move up to third. This entry was posted in Football, Sport and tagged Brentwood, Brentwood Town, Brentwood Town vs Tilbury, Ryman League, Ryman League North, Tilbury FC.